The Ratling people have always pestered the people of the land. However, with the Darkness's growing power, these vermin have grown bolder, more bloodthirsty, and better equipped. Like their rodent cousins, they swarm the tunnels and scurry about on nimble feet, striking and vanishing into darkness. There are even rumours of gigantic ratling bullies that rival the strength of a troll! 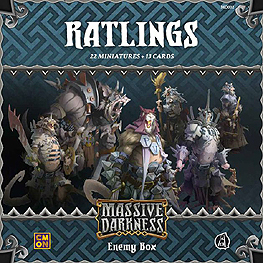 This Enemy Box contains two additional Mobs (Boss and Minions), an Agent, and a Roaming Monster, along with their game cards for Massive Darkness The Ratlings are fast and hard-hitting enemies: in melee or ranged combat, they can swarm your party of heroes and overwhelm your best defences instantly.